The South Beyond 6000 and other hiking destinations of the Southeast U.S.
Until today I only knew of Jonathan Ley as a PCT hiker who has helped other hikers by publishing a set of annotated PCT maps. But Jonathan is more than just a helpful outdoor enthusiast, I’ve learned. He’s also an accomplished professional photographer. I’ve just taken a few minutes to check out his photos from a recent trek across Iceland he made with fellow photographer Dave Cobb. I purposely didn’t try to reproduce one of his photos here. In addition to violating his copyright, I would never be able to do justice to how he’s displayed them in his site. And to enjoy them most you should also read his comments. Each photo is more breathtaking than the last. So go spend some time on this site! But I should add a word of warning: Once you get started you won’t want to stop until you’ve seen all 75 photos. Just when you think you’ve seen every alcohol backpacking stove out there, one turns up that’s truly unique. I stumbled upon the Littlebug stove after clicking a Google ad. There are two versions and each one is not only an alcohol stove. It’s also a wood-burning stove. The idea is that when wood is dry and plentiful and a fire ban isn’t in place, you can burn twigs in the stove and cut down on the carry weight of alcohol. In fact, the manufacturer’s Web site claims it’s faster to boil water burning wood than with alcohol, though you will get more soot. That’s pretty cool, but it’s not the best part. This is: the stoves are made by people with disabilities and other employment barriers. I can’t seem to get going on writing a trip report from my backpacking trip to Colorado. For that matter, I can’t seem to get motivated to write any blog posts since I’ve been back. And I know why too. After sitting in front of a computer all day long at work, the last thing I want to do is spend more time in front of a computer. National Geographic has added an online feature to go with a report in the August 2006 print edition about Great Smoky Mountain National Park. As the information goes, it’s pretty basic stuff. Nothing much there you can’t get in other online and offline sources. The feature does contain a few beautiful photos taken by freelance photographer Michael Melford. I’ve seen these photos published before, but one photo is unique, at least to me. It’s a four-photo sequence showing the same tree in a cycle through the seasons. It provides one of those, “Oooh, cool” moments in otherwise ordinary content. I was disappointed to not find more of that sort of thing. But I guess when you see a line like “Get the whole story in the pages of National Geographic magazine,” it means the best stuff has been saved for the magazine. I’ve added a few photos from my recent trip to Colorado to my Flickr account. There are still plenty more where these came from, so I’ll be adding more soon. A few hours ago we arrived back in Durango after five incredible days in Weminuche Wilderness Area. Our Boy Scout troop was divided into five groups and all returned safely with many stories of amazing sights and experiences. The crew I was in hiked some of the most difficult terrain I’ve ever trod and saw some of the most beautiful vistas I could imagine. Early tomorrow morning we board our bus to return home, but in the meantime, here’s just a small glimpse of what we saw. And I do mean small glimpse. I’ve taken so many pictures it will take weeks to go through them and try to pick out the best ones. This particular picture was taken on a climb we took to just over 13,000 feet. 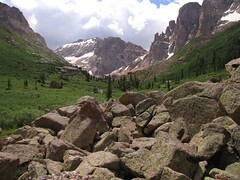 Below is the meadow where we camped two nights. In that time, we didn’t see another human. But we did see quite a few marmots. Yesterday morning our group of Boy Scouts, leaders and a few extra adults boarded a bus and headed to Colorado. About 31 hours later, we’re now in Durango. That gives everyone a chance to get a shower and sleep in a real bed for one night before we hit the trail tomorrow morning and begin our trek in Weminuche Wilderness Area. That means, of course, there won’t be any posts in this blog for a while. I didn’t check, but I presume Internet access hasn’t reached the backcountry yet. I sure hope it hasn’t, anyway. You are currently browsing the cutter\'s blog blog archives for July, 2006. "It is not the mountain we conquer, but ourselves." "The tops of mountains are among the unfinished parts of the globe, whither it is a slight insult to the gods to climb and pry into their secrets, and try their effect on our humanity. Only daring and insolent men, perchance, go there."